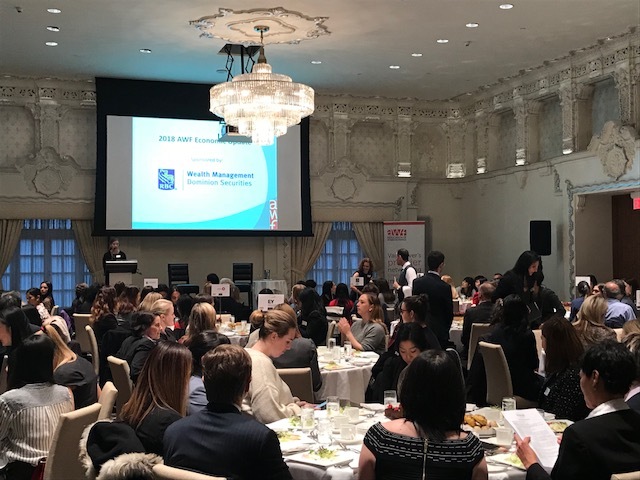 On November 23, 2018, the Association of Women in Finance hosted the Annual Fall Economic Update at the Rosewood Hotel Georgia for a sold out crowd of over 200 guests in attendance. Thanks to the support of the AWF community and our sponsor, RBC Dominion Securities, the event was a huge success. After a brief session of networking and a delightful lunch served in the Spanish Ballroom, the panelists began their presentations. Speaker panelists included Jock Finlayson, Executive Vice President and Chief Policy Officer, Business Council of British Columbia, and Mikhial Pasic, Vice-President & Fixed Income Portfolio Advisor, RBC Dominion Securities. Overall, the presentations had a positive, yet cautious, tone regarding the outlook for 2019. The main themes discussed included global economic trends, US and Canada interest rates and debt levels, as well as industry trends for BC. Both panelists agreed that the global economy has been losing momentum and that North America has reached a peak in its economic cycle. The event’s repeat panelist, Mr. Finlayson gave the audience an overview of the global, national and local economies. Notably, the global economy encountered several impediments including the US-China trade war, BREXIT turmoil and weakness in key emerging markets partially due to rising US interest rates and a stronger US dollar. Despite the recent political landscape in the US, economic expansion continued with growth in GDP and employment rates. In Canada, the labour market tightened across BC, Alberta and Ontario. Interestingly, Canada’s relative labour productivity has been decreasing since the late 1970’s with Canada’s GDP keeping up with that of the US by Canadians “working more” instead of “working smarter”. 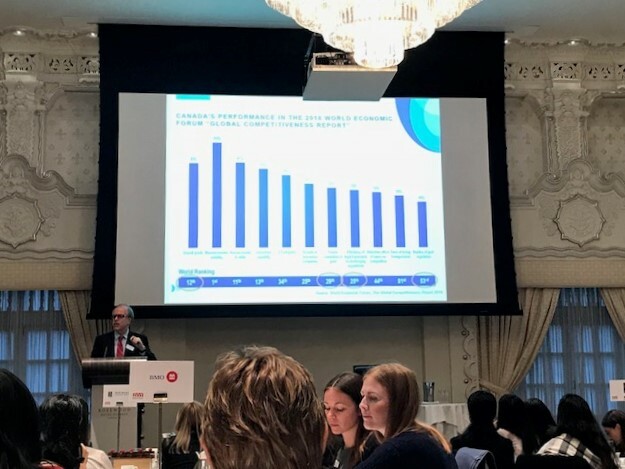 Further on the negative side, the presentation pointed to the record amount of Canadian household debt and the vulnerability it creates in the light of rising interest rates. Finally, Mr. Finlayson offered his thoughts on the disproportionate amount of “unproductive” residential investment, particularly in BC and Ontario, as well as on the newly legislated cannabis industry foreseen not to have a large impact on the general economy past the initial adjustment. A newcomer to the panel, Mr. Pasic offered an engaging look into the signs of the economy moving into the later stages of the economic cycle and highlighted several points to keep in mind as it happens. Per Mr. Pasic, there are four phases of transition from a slow-down to a freeze and we are in the second phase. Interest rates keep increasing, economic growth is back above potential, global labour markets remain tight with more job openings than those seeking employment and despite the later stage of the cycle, investors remain confident and significant amounts of corporate debt and stocks represent a large portion of household assets. As the economy transitions from phase two to three and four of the cycle, Mr. Pasic cautioned investors to keep aware of where their money is held as well as consider whether the investment it is at risk of market devaluations in the final stages of the cycle. On behalf of the AWF, thank you to our audience, sponsors, panelists and volunteers for yet another successful Annual Fall Economic Update! To view a copy of the presentations click here.